This 4-star hotel in Berlin features modern rooms, a rooftop terrace and a wellness area. 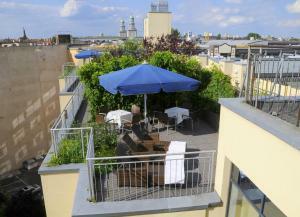 It lies in Berlin's lively Friedrichshain district, a 10-minute walk from the O² World arena. Warschauer Strasse S-Bahn Train Station is a 5-minute walk away, offering connections across Berlin. The East Side Gallery is 1 km from the Upstalsboom.